Birthday Status For Mother : Among all other relationship, the bond between mother and children is the best in the world. When you think about all the sacrifices which your mother made for you, it can bring tears to your eyes! So, you should find some special chances to show how much you love her and what she means to you! Your mother’s birthday is the most valuable chance to show your gratitude and love towards her. 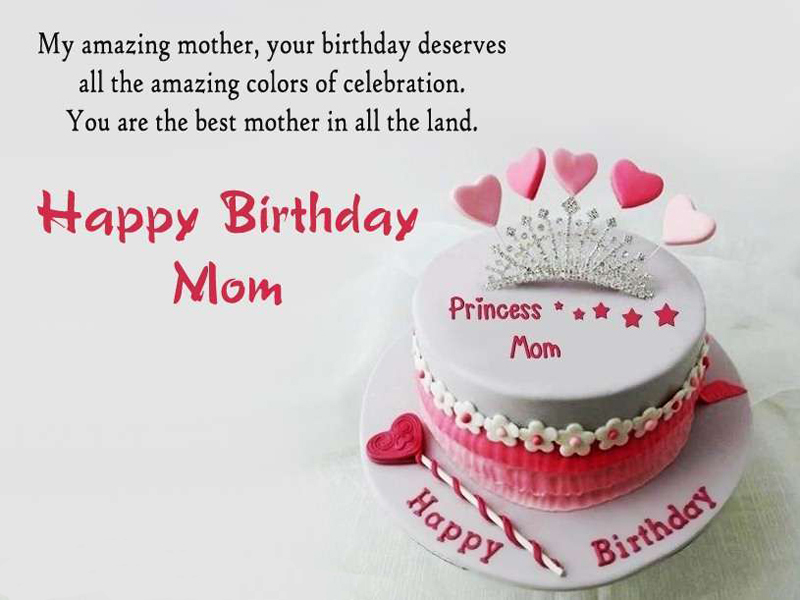 Here we gather lots of happy birthday status for mother, happy birthday mom wishes and messages which will help you during this celebration! Whether you’re a fortunate son or daughter you can make it amazing by wishing your mother a happy birthday with this birthday status messages. 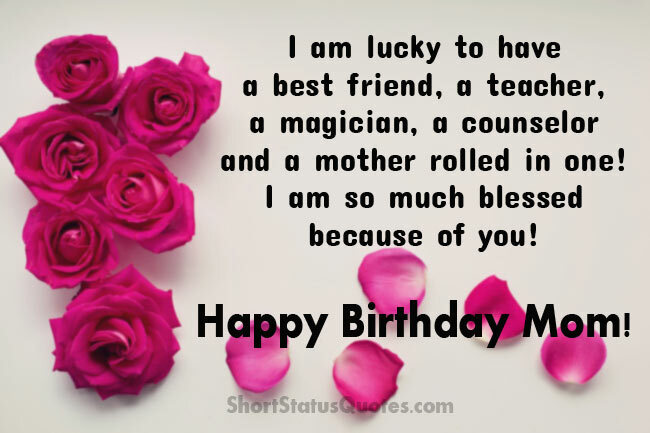 Just take a look to find the best wishes and share with her to say happy birthday mom! Give her a reason to believe that she has much more than just a son or a daughter in you who truly value the love that she has for you. Whatever I am today, I owe it to you. You are the most special person in my life. Thank you Mom. Happy Birthday to you! Throughout my life, you have always been the strength that holds me up in the storm of life. Love you, Happy B’day! To the woman that always brought the best in me or at least saw the best in me regardless of what I did. Happy Birthday! God doesn’t make angels like you anymore. May you celebrate your birthday with happiness and inner peace. Happy Birthday Mom! Hugs and kisses all day long. I’m so glad I get to call you my mom! Happy birthday! Roses are red. Violets are blue. You’re my very own super mom. Believe it, it’s true! Happy birthday! Praise to the heavens for the wonderful mom we have in you! Happy birthday, Mom! My eyes fill with tears when I think about how many times I’ve given them to you. Happy birthday mom. Happiness is having a mother like you. Sending you some special love today. Happy Birthday! No one can be as loving, supportive and protective as you. Happy Birthday Mom! Life hasn’t been fair but I’m willing to trudge it all because I have a mom who given it all up for me. Happy birthday. You are the greatest, most dazzling, sweetest person, and I love you. Happy Birthday Mom! To someone who is always there whether I am right or wrong. Happy Birthday Mommy! Heaven…. must be really small Cause I can see it in My Mom’s Eyes Happy Birthday to my angel Mother! Cherish the memories and look to the future. Thank you for teaching us this life motto. Happy birthday with love! You manage to fill so many roles in my life: mom, teacher, friend, and confidante. I am grateful for all of them. Thanks for being my everything, Mom. If motherhood had to be explained to someone without giving your example, it would be a worthless definition. Happy birthday mom. All the wonderful celebrations are waiting for you because it’s the birthday of the most beautiful lady in this entire universe. Love you mom, happy birthday. My life would not be complete without you by my side. You have been with me through all the good and the bad times. I wouldn’t miss your birthday for anything. Happy Birthday Mother! Mom, no one can ever take your place in my heart. I love you forever and ever. No matter where I go or who I meet, you will always be number one to me. For you my every day feels like a special day. So, I want to make your this birthday with all the gorgeous gifts I could ever bring you. It is absolutely your day and I wish you’ll enjoy a lot. Happy birthday. A loving and caring mom like you is all I need in this world. I love you so much. Happy birthday, mom. To someone who has taught me the value of living and of being happy no matter what our status in life is, Happy Birthday Mom! I am lucky to have a best friend, a teacher, a magician, a counselor and a mother rolled in one! I am so much blessed because of you! Wonderful bday, mom. I want to wish the most dazzling and greatest mom a very happy birthday. Love you, mama. I wish this wonderful day becomes the best day ever in your life. Have fun. Happy birthday, mom. Mommy, I wish you a joyful and happy birthday, today is all about you, and let no one tell you otherwise! Love you! Happy birthday to the most amazing mom! I wanted to wish you an unforgettable birthday, filled with lots of joy and happiness, but most importantly – love! Every mom is special, but trust me there is no other mom who can be compared to your qualities and abilities. On this special day, I want to thank you and wish a happy birthday. Dearest Mother, you guided me and gave me your boundless love. On your birthday I wish you much peace and joy. May your day and year be filled with blessings and be as wonderful as you. Dear mom, today is a great day to celebrate! Thank you for always being there when I needed you, I wish you strong health, endless joy and happiness. May you live a million-year mother, happy birthday. If I can grow up to become even a LITTLE of what you are, I will consider myself to have achieved a LOT. Happy birthday mom. Mom, you are still gorgeous after all these years. It makes me so glad I have your genes! Happy birthday to my stunning mom, and may your birthday be as lovely as you are. I know you are getting older every year Mom but think on the bright side, you will at least always be younger than Dad. It’s good to celebrate the little victories! My greatest wish is to grow up and become just like you. Happy Birthday Mother and thank you for all your strength and advice that have helped me become the person I am today. A mother like you is a blessing for her children. You have made our house into a home and our lives into a ministry. God bless you, Mom. Happy birthday! As a rebellious teen I hate doing ANYTHING with you but at the same time deep down inside my heart, I know that I’d have been NOTHING if it weren’t for a mom like you. Happy birthday. You are like a well-polished diamond: you shine brightly as a great MOM. Happy Birthday! Mom, because of you, I became me. I love you so much mom can’t you see? Happy birthday. 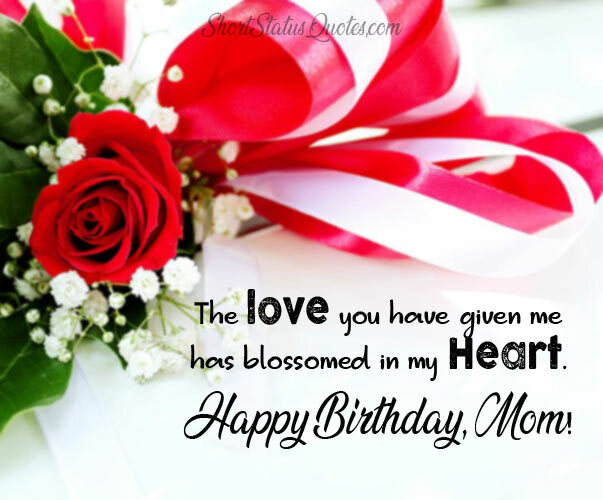 We hope, you have got the most beautiful birthday status for mother to wish her a very special happy birthday! Surely, she will be charmed by getting these happy birthday mom wishes and messages from you cause these statuses are too cute to make her smile and happy!